Hi everyone! Today I'm sharing my last Echo Park design team assignment with you — a Valentine's Day card made with the Lucky in Love collection and coordinating Hello Sweetheart 4x6 Designer Stamps. Although I'm not a fan of candy conversation hearts, the non-edible versions included in the Hello Sweetheart stamp set were so sweet, I had to use them on my card. When I started thinking about making this card, I knew I wanted to showcase the stamps in a fun way. I designed a card cut file (which I'm sharing with you, for free, via Dropbox) with circular openings on the front panel so I could place stamped images and other elements inside each of the circles. The finished card is 5 1/2" wide x 4" high. You could also use it in the vertical position making it 4" wide x 5 1/2" high, giving you three rows of two circles. Well, that's it for today. I hope you enjoyed seeing my card today and all of my Echo Park assignments over the past year. The Lucky in Love collection is available in the Paper Issues store, where you can get 20% off of your order if you use the code LISA20 (this applies to anything else you buy as well). 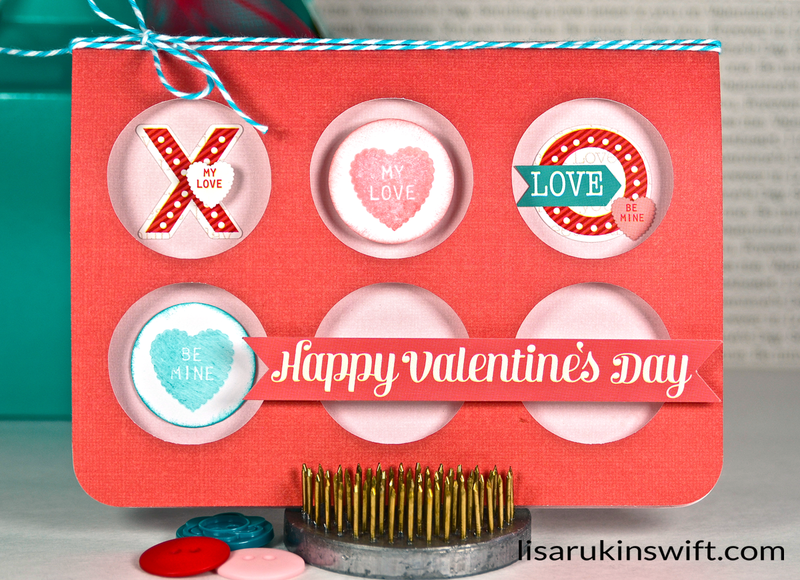 This collection doesn't have to be just for Valentine's Day as you can see from the Mother's Day layout (and tutorial) I shared last week. I love this card Lisa!!! Thanks for the cut file too! Love that card!!! Very pretty and I love how you used the candy words. Love the card, Lisa! You have done a great job showcasing the stamps! Awesome card, Lisa, love the colors! So thoughtful of you to share your cut file and if I had a Silhouette, I'd be all over it! I'm sure you'll be missed at Echo Park, you always create such wonderful projects with their collections! So cute! Loving all those circles! Ohhhhhhhh I love love love this!! LOVING those circles!!!!!! Fabulous card!! Love how you did the circles with stickers and stamped images!! Fun colors too!! Such a cute card. I love the design! Love those circles Lisa!! Such an adorable card!! This card is so cute, love it!! I am so behind in my visiting and commenting - Sorry - I have missed you!! This card is so cute and what a wonderful cut file!! Love the way you sponged around the little circles before placing them inside the other circles - Just a super sweet and adorable card!! !